Product Reviews allow for recorded product ratings and comments. Customers shopping or buying will be able to write reviews as well as see the reviews other customers have entered. This can be a great conversion tool and help increase sales. Activates product reviews for the given store. Product Reviews will appear for your products once this page is saved if you are not using Custom Page Design for the corresponding page. Requires login before a customer can create a review. Requires the store owner or admin to review and approve the review before it will be added. The Default Rating Dimension for your store that will be assigned to Categories that do not have specific Rating Dimension Groups assigned. If left as Single Rating Dimesion - No Group, the product will be rated by overall features. Assigned email template that will be sent when a new review is added. Assigned email template for approved reviews based on moderation. You can have more than one rating group that allows customers to rate products based on different criteria. 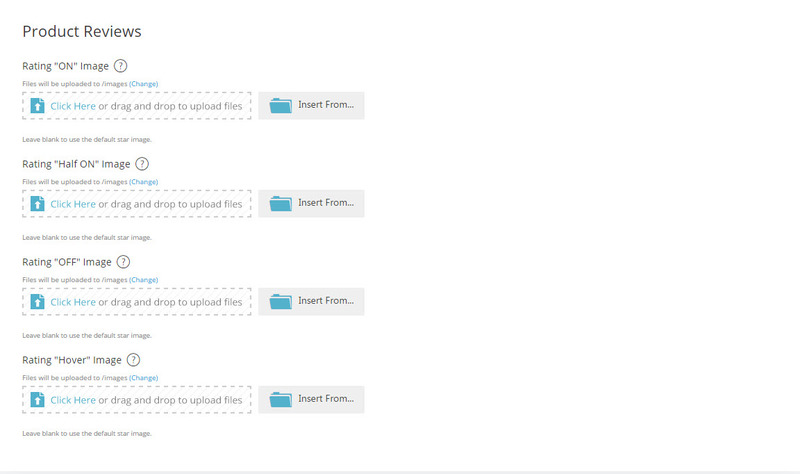 Click New to create a new group, or select an existing group from the drop-down menu to edit it. Then specify the rating criteria. The image below is for reference only. Your store can have its own criteria. You can add new Rating Dimension Groups and Rating Dimensions to assign to a store or certain categories. These act as features of classifications for Rating a product. Whether it be on Style, Quality or Durability, a customer can rate it by specific Rating Dimensions. Enter a Rating Dimension Group name and Save. Enter a Rating Dimension Name and Description, then Click the Save button. 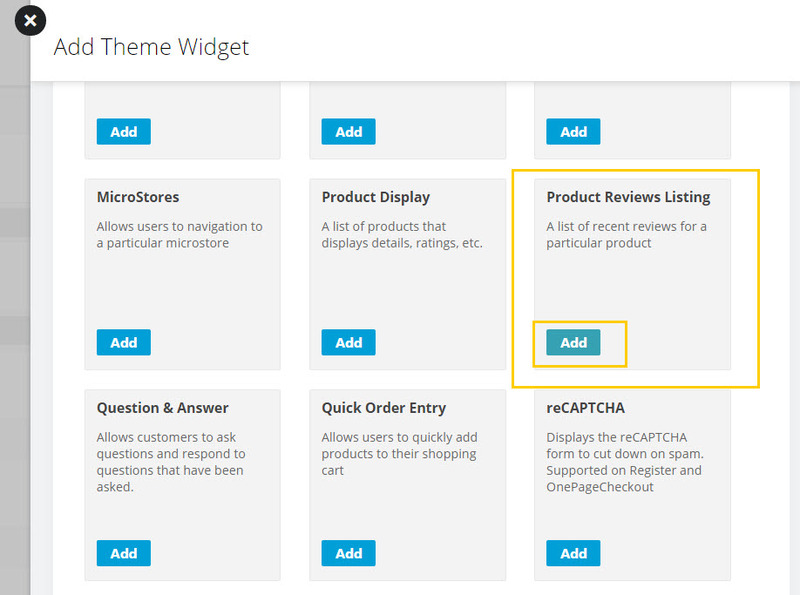 If you have Required Moderation active or you would like to remove some Product Reviews from displaying. This page acts as the moderation listing page. You can filter all of you Product Reviews and decide whether to approve or reject them. 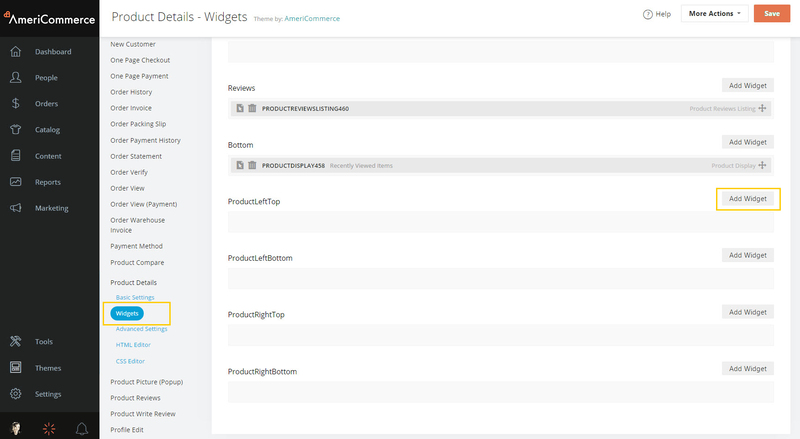 Browse to Themes > ActiveTheme; select Product Details from Pages section of the Accordion menu, then click on Widgets. This widget is only valid on the Product Details page.